Red House Farm Livery is a private family run business situated in the pretty village of Levington; on the outskirts of Ipswich. We are set in 40 acres of land and cater primarily for DIY livery, however we do have a freelance groom who can be called upon when needed and for holiday cover! Stables range in size from 12x12ft to 12x14ft and each stable is fitted with an automated drinker. A personal locker is included with each stable and a shared secure tack room with a nominated saddle rack and bridle hook. Storage for hay, feed and bedding is available in the hay barn. 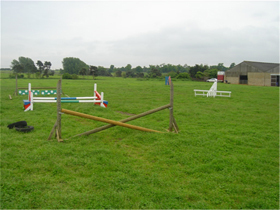 We have an outdoor and floodlit indoor arena with access to show jumps and dressage cones at no extra charge. We also cater for storage of trailers and horse boxes, prices for trailer and horse box storage can be found here. We have a number of pictures of our livery in our gallery. © Copyright Red House Farm Livery. All Rights Reserved.